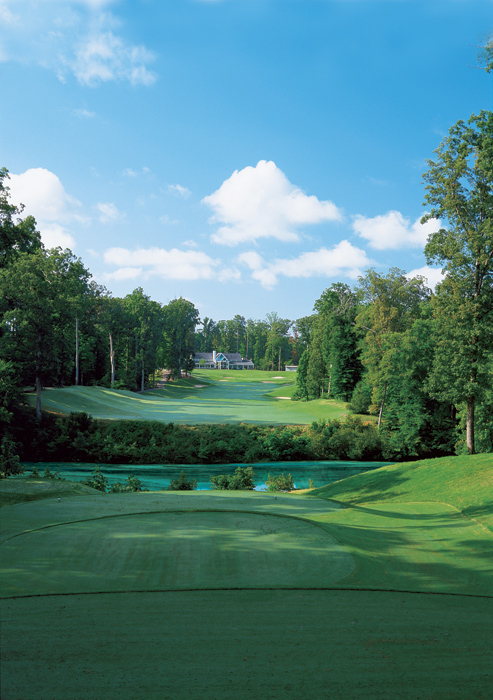 In an effort to create a two-course facility that would be able to handle large convention groups, the Golden Horseshoe hired Rees Jones, son of Robert Trent Jones Sr., in 1991 to build a complement to the heralded Gold Course at The Shoe. What he created in no way resembles Trent’s classic masterpiece. 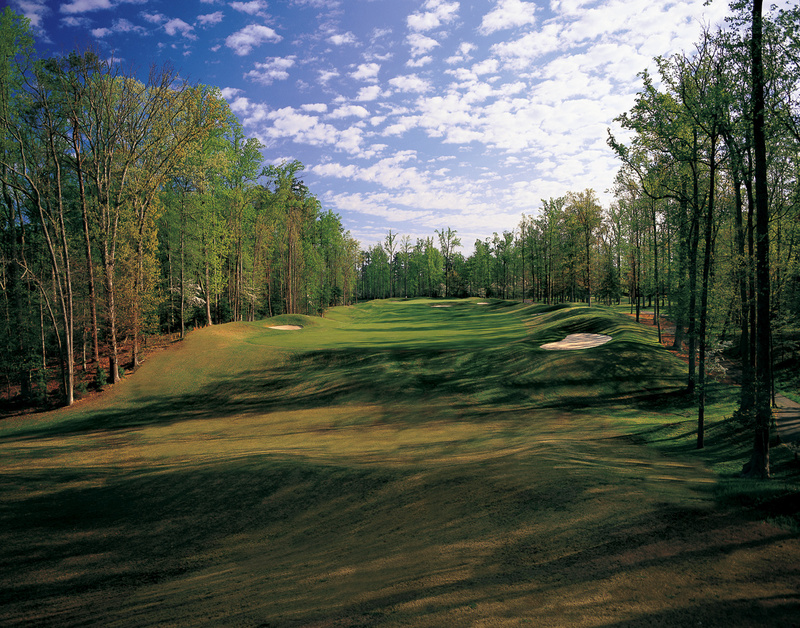 This is a contemporary styled wooded course winding through tall beech, oak, and pines and more gentle rolling terrain than it’s sister where they moved lots of earth to get the shaping they were looking for. 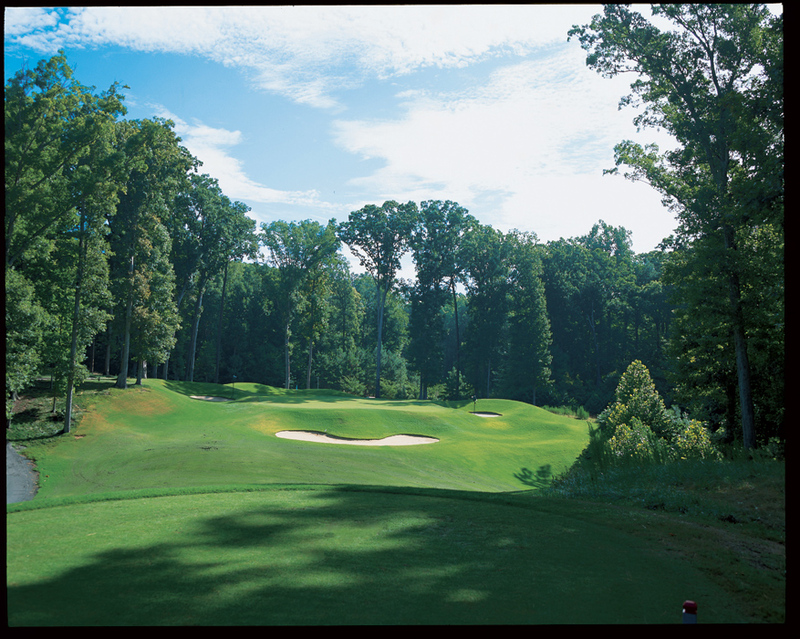 The most distinguishing characteristic is enveloping mounding-every hole over 200 yards long seems to have a wall of mounds on both sides that contain the area of play and keep balls from chasing into the woods. I am convinced the owners said to Rees we don’t want 30 handicappers out here for six hour rounds looking for their Pinnacles in the woods. The mounding around the greens is wild as well but here at least it leads to some creative pitch saves when you miss the greens. The sequencing of the holes is interesting-you start with four par fours without great distinction. You don’t see a three par until 7. At that point the character of the course changes dramatically and you have to start paying attention. The middle six are actually the meat of the course for me. There are three par threes from seven to eleven and not another par five until fifteen when you will see two in the last four holes. The last three are very technical holes-shortish par four, long par three, and an interesting par five to finish. The main criticism I have is that the holes tend to be pretty straight, only two real doglegs in the bunch, and many of the holes start to appear alike though the green set mounding and sculpting make them play differently. This is by no means an easy course-the rating and slope from the Blue Tees is actually higher than the Gold but I think the difference is that less blowup holes are lurking here than across the campus. The zoysia grass fairways also make it play even longer and the side mounding also leads to lots of side hill approach shots into the greens. Don’t always reach for the driver there are holes where position trumps length and the well place three wood or hybrid will be the better choice of driving club. The green shapes themselves are very varied and interesting and you have to ignore the straightness of the fairways and think carefully about approach angle relative to pin position to get good scoring opportunities. The par threes are easily the most interesting holes out here-all feature elevation change and unusual green complexes with varied pin positions, difficult sculpting and undulations, and nice variety in length. The water in play on the course is only on #11 and the drive on #18 so the chance for the triple bogey threat is only if you double pump a tee ball into the trees and that is hard to do over the side walls. Keep your head about you-concentrate on the driving lines and you will enjoy this day. This is a fun course-sporty and interesting-and a great complement to the challenges of his father’s track.